With this option, the tissue from the back (the latissimus dorsi muscle) is used to reconstruct the breast, either with or without an implant. First, the tissue (located at the back of the shoulder blade) is brought around to the breast mound to create the new breast. 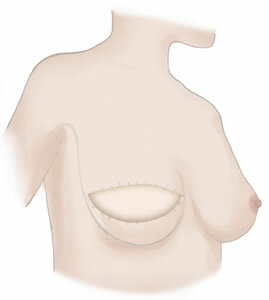 Then, depending on the desired breast size, an implant is inserted underneath, as the latissimus dorsi does not always provide enough volume. It can also create a more natural breast shape. The scar is usually horizontal, so it can be hidden under bra straps. Occasionally, it is diagonal and therefore more difficult to cover.With this option, the tissue from the back (the latissimus dorsi muscle) is used to reconstruct the breast, either with or without an implant. Using the latissimus dorsi (known as an LD flap) with an implant reduces the risk of complications such as infections, implant extrusion (when the body rejects the implant), or capsular contracture (excessive or invasive scar tissue formation). It generally creates a more natural looking breast than using an implant alone. Patients can avoid scars on the tummy, buttocks and thighs. 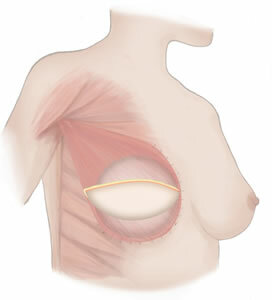 The LD flap combined with an implant is a popular choice for women with a larger breast size. 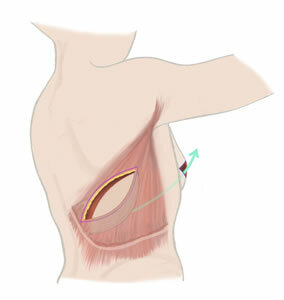 Because a muscle is removed from the back, some women may experience weakness in the shoulder. 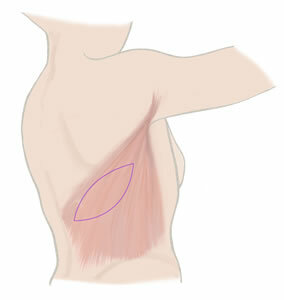 Although physiotherapy can help, the shoulder may never fully regain its former strength. This may be an important consideration for women who are very active, for example, those who swim, climb or play tennis or golf. Implants do not last a lifetime (and risk rupture) and therefore will need further replacement surgery at some point. Less common problems include infection and haematoma. Seroma (swelling in the back where blood/body fluid has collected) is more common. When lymph nodes are cleared, there’s sometimes a risk of lymphedema. Other risks include loss of the skin flap that’s been used for the reconstruction; blood transfusion (unlikely); shoulder and back stiffness; aches and pains; implant extrusion (when the body rejects the implant); and capsular contracture (excessive or invasive scar tissue formation). Further Treatment: Check up with your surgeon/registrar. Visits to the Hospital Dressing Clinic. Regular visits to Outpatients department for injections if tissue expanders are used.